Thoroton Society Record Series Volume 48 (2014). 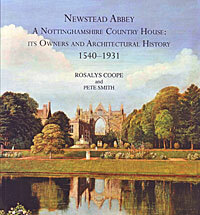 Newstead Abbey : a Nottinghamshire Country House: its Owners and Architectural History 1540-1931, by Rosalys Coope & Pete Smith. 214 pp. ISBN 978-0-902719-26-2. This volume is unusual for a Record Series volume in that it is devoted to a single topic - the architectural history of Newstead Abbey over 800 years. However, it does include full transcripts of the extensive household inventories of fittings and furnishings of 1740 and 1778. The Augustinian priory of Newstead in Nottinghamshire’s Sherwood Forest was founded in c.1163. Following the Dissolution of the Monasteries it was acquired in 1540 by the Byron family who used it as a country house until it was sold in 1818 by Lord Byron the poet. Under the name of Newstead Abbey it subsequently passed through the hands of the Wildman, Webb and Fraser families before being presented by Sir Julien Cahn to Nottingham City Council in 1931. Since then the Council have maintained the house and gardens together with important collections of furniture, paintings and Byron artefacts. This volume gathers together in a single chronological narrative a series of articles on different phases of the Abbey’s architectural history written over a period of 35 years by architectural historian Dr Rosalys Coope and published in the Transactions of the Thoroton Society. The opportunity has also been taken by Dr Coope - assisted by retired English Heritage officer Pete Smith - to revise and extend some of the original conclusions in the light of new research, particularly the evidence offered by newly identified drawings, paintings, and engravings (some even painted on Sevres dinner plates). The revised account emphasizes the major contribution of the 5th Lord Byron who lavished so much money on ‘Gothicking’ the house and park that he virtually bankrupted the estate by the 1770s, earning him the perhaps undeserved epithet of the ‘Wicked Lord’. His passion for re-enacting naval battles by scaled-down sailing ships motivated him to erect three mock forts around the lake. The book is a masterly piece of detective work incorporating evidence from written records, illustrations and the fabric of the building itself to unravel the complex architectural history of this remarkable country house. The book is lavishly illustrated with 112 plates and diagrams, most in full colour. Free to Record Series subscribers. Otherwise Price £20 (£25 post paid, UK; overseas at cost) or £15 to members of main Society (£20 post paid, UK; overseas at cost).